Conveyors of various kinds are of course widely used in industry, transport, communications, etc. On this page I include a few examples of similar devices to those used in shops. 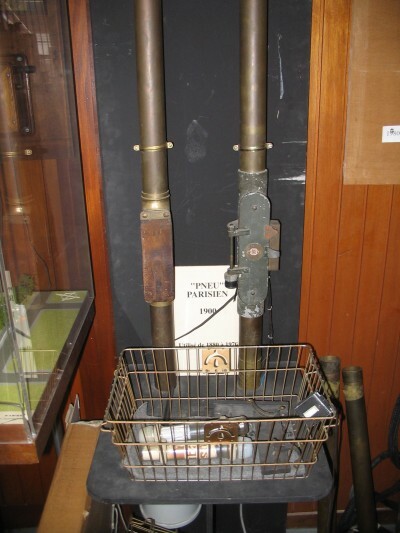 Pneumatic tube conveyors were in use elsewhere well before their use in shops. Unlike shop systems, other applications sometimes had the requirement to dispatch carriers along the same tube but to different destinations. Lamson's "Pre-selector" system was based on automatic relay of carriers. The carriers were preset for their destination and the exchange could then operate automatically. (Lamson memo of 17 March 1953). See also "Dialled Despatches" under Transport below. "Beyond the stairs down to the lower level is a room with an intriguing message handling system for passing paper messages to the floor below. It consists of a wire basket and a system of ropes and pulleys for lowering the basket to the lower corridor. The basket locks in position in the upper room but can be released by pulling on the rope from below. The system is manufactured by Lamson who are better known for the 'Lamson Tube' a pneumatic message handling system used in many government buildings and still used in some department stores. One section of cord (down to the lower level) has perished and broken off but the basket can still be lowered and raised but only from the upper room. Similar message baskets exist at the Brislington & Birmingham war rooms." Other systems have been reported at the Manchester Regional War Room, Cheadle and the Battle of Britain Operations Room, RAF Uxbridge (tube system). At the Armoury pub in Victoria Quay, Shrewsbury, food orders were sent to the kitchen through a modern (plastic) pneumatic tube system. "Now disappeared" according to CAMRA's WhatPub website. An advertisement in Newcastle Evening Chronicle, 26 Mar. 1969, p.5 claims "The completely modernised St James' Hall... For better bingo! With the latest equipment... Rapid wire centralised checking - it all happens before your very eyes." See also the reference from Meadows. An odd use is alluded to in the Annual Report of the Indiana State Board of Health, 1898, p.93 "Petersburg Sanitary Canning Company: It is now a good plant, except for one thing - the cash carrier system for conveying tomatoes through the process." An interesting mix of technologies occurred at the National Insurance office where Lamson carriers were used to convey Hollerith punched cards. Conveyors are used to carry medical samples to laboratories. Aerocom installed the system at Letterkenny General Hospital in Ireland. Michael Wofsey writing in wired.com tells of a 9-foot long python escaping from a hospital laboratory through the pneumatic tube system. The Capsule Pipelines website and Encyclopaedia Britannica mention the use of pneumatic tube systems in hotels. There is a good account of the pneumatic tube delivery system at the Waldorf-Astoria Hotel, New York, in Scientific American, 16 April 1892, p.243. It was installed by the Miles Pneumatic Tube Company and had been in service for a year and a half. In the busy season it handled 10,000 letters, cards, newspapers, etc. per day. There were 14 tubes, one to each floor, of 3 inches diameter. Messenger boys delivered from each floor station to the rooms. An item in the Times (28 July 1909, Engin. Suppl. p.18) stated that hotel systems were a speciality of Lamsons. They could be seen at the Ritz, Piccadilly, Cecil and Savoy. The first practical application of pneumatic tube capsules was by Josiah Latimer Clark in 1853. The tube ran between the central offices of the Electric and International Telegraph Company on Telegraph Street in London and their offices at the Stock Exchange. It was 220 yards long and 1.5 inches in diameter and carried messages which had been transcribed from the telegraph. (Encyclopedia Britannica vol. 18, 1957, pp95-96.) Each carrier had a felt pad on the front end to act as a buffer and was covered with leather. A 6 HP steam engine created a partial vacuum in front of the carrier and carriers travelled at 20 feet per second. The original tube was one-way only and empty carriers were returned to the Stock Exchange by messenger. A second tube of 2 1/4 inches diameter was installed in 1858 from a branch office in Mincing Lane. T.Standage. The Victorian internet. (London:Weidenfeld & Nicolson, 1998). The first one outside London linked offices in Castle Street and Walter Street in Liverpool. 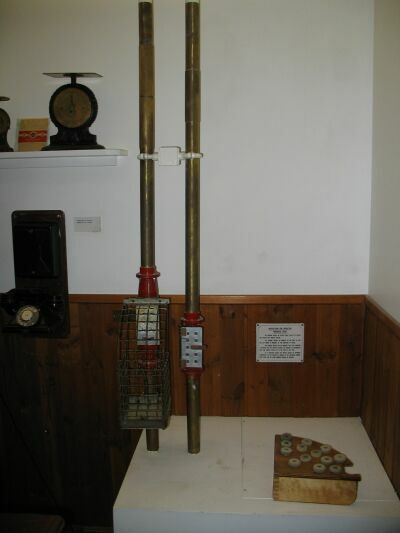 Kennedy's article of 1909 (see References) states: In all large towns of the United Kingdom the Post Office has used pneumatic tube services as a valuable auxiliary to the telegraph system. In London the point from which these tubes radiate is the Central Hall at St Martin's-le-Grand. [This is illustrated.] In the majority of cases only one tube is provided between the central station and the outlying office, this tube being worked in both directions... The longest tube working in this country is that between the Central Telegraph Office and the House of Commons .. a length of 3992 yards. The total length possessed by the Post Office is 85 miles. Other cities had similar systems - Berlin from 1865 and Paris from 1866, known as the 'Carte pneumatique' or 'pneu'. The Paris system later allowed postcards and small letters to be carried at premium rate and was shut down only in 1983. New York, Brooklyn, Chicago and other cities had tubes of 8 inch diameter for postal purposes up to the 1950s. The Encyclopaedia Britannica article and the Capsule Pipelines website have references to many other systems. In 1909 the Times (28 July, Engin. Suppl. p.18) stated that Lamsons had supplied pneumatic tube despatch systems to three Italian cities, Rome, Naples and Milan, to connect railway stations, the stock exchange and the general post offices. An article in Scientific American, 26 Mar. 1892, p. 199, describes the pneumatic tube system in the Western Union Central Telegraph Office in New York. In the main operating room there were 16 radiating lines with four to six stations on each line. Twenty-four house tubes terminated in the gallery with four street tubes running north to 23rd street and four running south to exchanges below Wall Street. A terminal from the Paris "Pneu" in working order at the Musée Regional des Télécommunications, Marcq en Barœul near Lille. The manufacturer is Saunier Duval Frisquet, Paris. The 58th Report of the Postmaster General, 1912-1913 (Cd. 6495) p.20 reports that "Cash Conveyors have been satisfactorily adapted to the conveyance of telegrams, and several types of carrier have been introduced at various offices. For instance, a 'Lamson Pick-up' carrier was introduced at Birmingham (this was a kind of cable system), a 'Gipe' carrier at Gloucester, and the 'Rebesi' and other types are in use or under consideration." Lamsons told me that the last new Rapid Wire system to be installed was at Schiphol Airport in the Netherlands around 1953 for conveying air tickets. It used Kick-back cars. Aerocom's clients include Lufthansa Airmotive and Irish Express Cargo. Lamson carriers were used between the wireless office and the bridge on the Queen Elizabeth, HMS Vanguard and many other ships. There was a D.D.Lamson installation at Euston station, London in 1970. 'D.D.' relates to 'Dialled Despatches'. "Users clipped a coloured end cap to the document carrier to indicate a specific destination; the caps had a mouth organ-type reed, tuned to a different frequency for each destination. As the carrier whistled along the tubes, the reed hummed its note and at each bifurcation in the tubes, tone detectors 'switched the points' to guide the carrier to its correct destination." (Andy Emmerson in uk.telecom newsgroup, 27 Nov. 1996.) It was reported that a complete circuit took four minutes.